This is one of my favourite books. It explores the discoveries of the famed Stanford Creativity Course – a twenty-five year journey undertaken by both MBA students and corporate executives. It explores our motivation to reach for something beyond ourselves – something more important than just day-to-day routine. A legacy. A life well-lived. Some reading can only be described as ‘juicy’ and this is one of the best. This is a book for anyone who wants more out of life – and how to get it. Michael Ray discovered that people who move beyond ordinary success and achievement have a secret. They live for a highest goal that drives them to accomplish their dreams, find fulfillment, and become generative leaders. 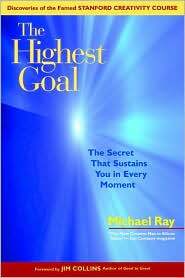 Here, Ray shows you how you, too, can thrive by incorporating this powerful secret into your daily life.